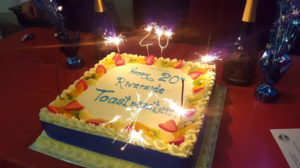 2018 marks a massive milestone for 20 years of Toastmasters Riverside Communicators based in Twickenham, West London! The ‘Riversiders’ marked this achievement by hosting a celebratory themed meeting on the 1st June. It was only right to celebrate this at the York House Venue, based in Twickenham, which has been the home to Riverside for the past 20 years. For this one evening, we were granted special access to the Winter Garden Room, a beautifully decorated glass room overlooking the green landscape of the York House Gardens. Riverside members and guests arrived in their best attire and enjoyed an evening of 20th Anniversary themed speeches. 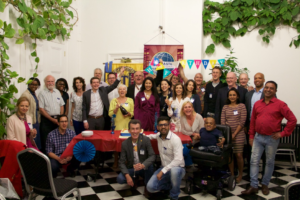 Russell Searle (Area 29 Director 2016-17) and Jacqui Rosser (Riverside Past President 2017-18) took us on a journey of ‘Riverside – Then and Now’, followed by entertaining speeches from members Errol Williamson (Riverside champ of many contests! ), Glen Savage (Immediate Past Area 29 Director) and Sonia Aste (Riverside Past President 2007-08). With a mix of past and current members present in the audience, a strong feeling of electric energy, pride and team work amongst Riverside members was visible through our smiles. 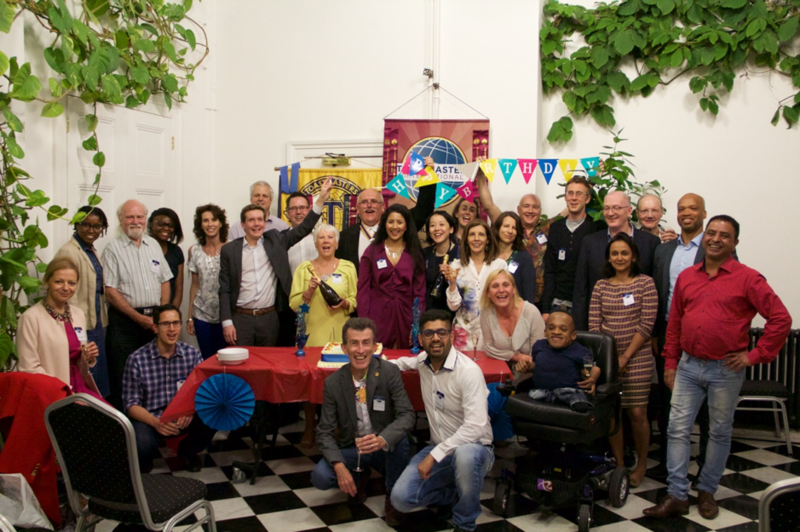 As Table Topics Master, the wonderful Sam Mackenzie put together 20th Anniversary Themed Topics and what a fun scene it was to see our past presidents, guests and members participate. All in all, we had eight Past President attend our celebratory bash (See Photo Below)! The evening was complemented by a buffet of delightful foods and treats, drinks, decorations and we even cut a 20th Anniversary Cake made specially for the celebration. Presidents Bonnie Wong (2017-18) and Ruth Rubeiro (2018-19) sealed the night with awards and a beautiful closing speech. A super evening, to acknowledge a super Toastmasters club!